I’ve just spent two days in the Bronx, taking my son to a baseball showcase near the Botanical Garden, the Bronx Zoo , and Fordham University. For a foodie, this area is Italian nirvana and home to one of the city’s most vibrant Italian communities, Arthur Avenue . 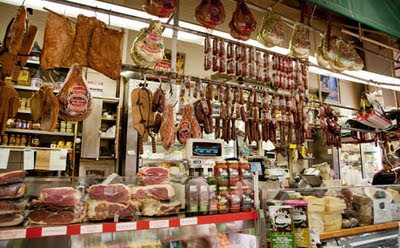 A shopping destination for all food Italian with some very good restaurants, too, the streets here are lined with macellerie (butcher shops), gelaterias (gelato shops) and an expansive covered market at 2344 Arthur Avenue that’s been in operation since 1940. Have a pre-dinner antipasto at Mike’s, a traditional Italian butcher shop and deli at the Arthur Avenue Retail Market, with a tantalizing array of Italian salumi and formaggi. For more than 60 years, the Greco family have satisfied customers both here and at their trattoria across the street with appetizers, olives, and main dishes like melanzane alla parmigiana, linguine carbonara (with pancetta, parmesan and cream) and penne matriciana with plum tomatoes and pancetta. Chef Dave Greco, who showed off his cooking skills on Bobby Flay’s “Throwdown with Bobby Flay,” will happily schmooze with you as he makes sandwiches at the counter or espresso at the trattoria. You might also see Dave’s mother helping out in the kitchen or his father, Mike, singing a tune at the deli. It’s all in the family, Italian-style. Don’t miss the deli’s daily cheese demos, with selections straight from the homeland for only $4.95. Got a hungry crowd feeling the red-sauce vibe for an early dinner? After gorging yourself on Mike’s appetizers, Dominick’s is your destination. Here you’ll enjoy oversized family-style portions at undersized prices in a setting that hasn’t changed since it was opened. All the usual menu suspects are here from chicken to shrimp and calamari, but there’s no menu. You just ask for what you want, and chances are you’ll get it. A sweet finish is promised at Artuso’s, an authentic Italian pastry shop, now 65 years old. Artuso’s recipes come straight from Calabria, creating memorable sweets, cannolis, biscotti, and sorbetti. What keeps customers coming back again and again, however, are Artuso’s cakes, traditional yet original, and always amazing. You’ll also be giving back to the community by patronizing the bakery, as Artuso is committed to keeping the Belmont neighborhood alive and well. The founder and owner is so well-loved that there are a street and park named for him.